Honeywell’s Chicken Liver Patè with Brandy and Orange. 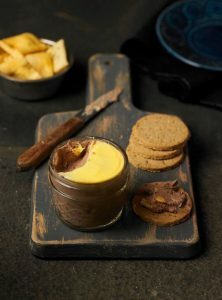 Our Chicken Liver Patè is one of our most loved products and is a recipe that’s been handed down the generations in our family and now you can have a go at making it yourself! This little delight is perfect all year round but it’s extra special during the festive period, packed full of seasonal nutmeg, bandy and fruity orange to give just a hint of sweetness that sets the whole thing off beautifully! You can of course let us do the hard work and pick up a pot or two in store to enjoy at home! Generous pinch of salt and black pepper. In a large pan on a medium heat, add the onions and garlic to half the butter and 1tbsp olive oil. Fry for a couple of minutes. Add the chicken livers and season with the salt and pepper, then grate in half the nutmeg. Cook the livers for around 6 minutes, until just slightly pink in the middle (if you over cook them, you’ll end up with a grainy patè). Add the Brandy and Wine for the last couple of minutes. blend with a stick blender or food processor until smooth. Taste and season again appropriately. Blend for a further two minutes. Pour the patè into individual ramakins or a large serving bowl and set aside. in a small pan heat the remaining butter on a low heat and allow to melt slowly. Once melted skim off any whey that’s risen to the top and pour over the patè. Place the Orange slices on top and pop in the fridge to set and seal as the butter hardens. serve with hot toast and a generous dollop of your favourite chutney!